My last 2 posts have featured a farm in the rural village of Lodi, OH, and have been very popular! In fact on one day last week my post was viewed 25 times in Greece which I’ve never seen happen before! The blog is seen all over the world and that is amazing to me, but this is the first time I’ve seen a foreign country viewing my post more than right here in the U.S. on a given day! I’ve decided to continue with another look at a rural setting that I shot recently. As a little background, I’m working (slowly) on a documentary project on migrant workers and their impact on the economy of my home county, Lake County, OH. A friend and mentor, Gary Harwood, did a similar project, resulting in the book “Growing Season” about the migrant community in Hartville, OH. The community in Hartville has built quite an infrastructure to support the migrant community, so I visited recently to interview some folks and see firsthand what they are doing. It was quite impressive! Check out Gary’s book for an informative and beautiful look! It was a quick trip but on my way in and out of Hartville I was looking for a few shots that gave a taste of this nice rural community. 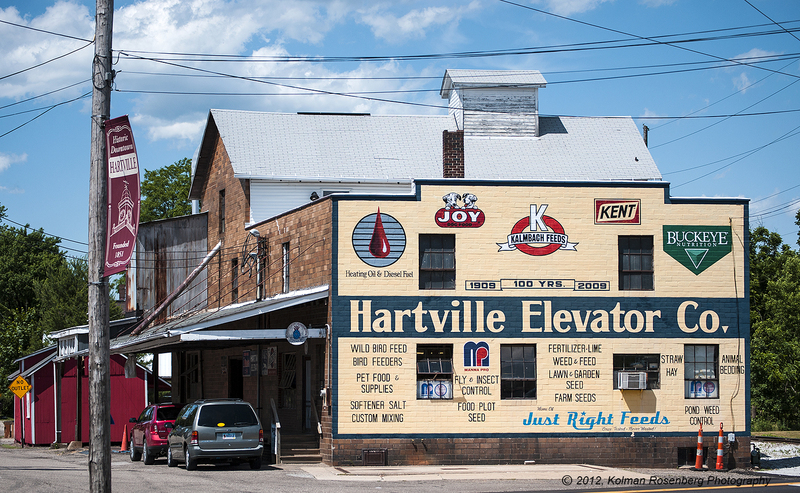 Above is a shot of Hartville Elevator Co. A little taste of yesteryear for most of us. We had a similar company in Mentor when I originally moved here, Mentor Elevator. It has since given way to a typical strip of stores. From practically the same location, I turned around and saw this shot. Century Feed Mill and it’s railroad spur stretched out to the south of the village. 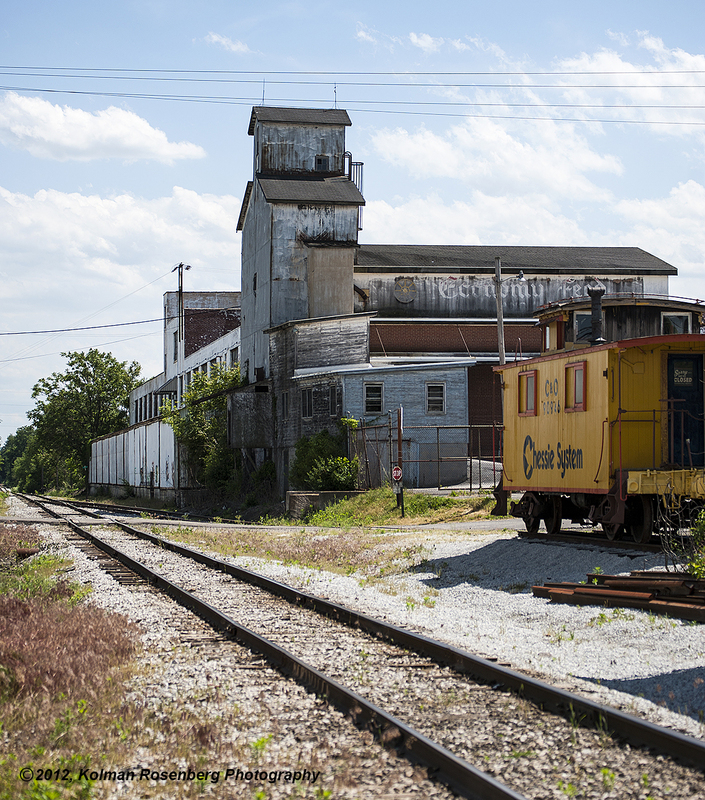 It appeared to me that this mill is closed but it made for a nice photo with the leading line of the railroad track and with the mill and Chessie System caboose anchoring the photo. I wish I had more time to spend in Hartville, but I had another shoot to do later in the day and had to go back home and pick up some additional equipment. As I drove out of Hartville, about a mile from where I took these photos, I came up the signs of growth! A major shopping center was just down the road with the typical big box stores and chain restaurants. I found myself thinking about how much longer the town would keep it’s rural charm and flavor? I hope it holds on for many years! As my last few posts have shown me, there is a yearning for the quieter, peaceful, rural settings that are disappearing from our landscape! I’m glad I stopped to capture these scenes! They may not be long for this world. I hope you enjoy them as much as I do. This entry was posted in Uncategorized and tagged americana, big box, caboose, centruy feed, chain, chessie system, community, David Hassler, Farm, feedmill, Gary Harwood, Growing Season, growth, Hartville, hartville elevator, history, infrastructure, living, lodi, migrant, mill, OH, ohio, progress, railroad, Robert Coles, rural, the life of a migrant community, worker, yesteryear. Bookmark the permalink. I, too, remember the days of Mentor Elevator. Thanks for the reminder. I’ll be expecting an autographed copy of your book. I’m happy for you and happy for all the people that will have further exposure to your considerable talents. You’re too kind Carole, but thank you! It’s a deal! I don’t know if I have a book in me. I’ve intended for it to be a documentary article but the more I learn the more I think there will be much more information than needed for an article! I started doing the blog in order to force myself to write. I am enjoying writing more than I used to, but a book? We’ll see! Correction: when I blew the feedmill photo up larger I realized that the fading paint on the side of the building reads Economy Feed, not Century Feed as I had thought! Those old feed mills and grain elevators are fascinating and sadly disappearing, even in rural Southern Ohio where I grew up. At least photos like yours will survive to show what was. It’s a sobering thought Sally, but you are probably correct! With digital photography we will have to continuosly move our image files to newer technology if thay are going to last though! Or print a lot more! At the present time I have approximately 160,000 images saved! I just recently bought a picture someone painted of your shot of the rural scenery. Same little building and stop sign and railroad. It says Hartville on the little bluish building. Not sure how old it is. Thanks for posting this! That’s really interesting Heidi! Thanks for telling me about it! I took the photos a little over a year ago. It seemed a quaint kind of picturesque scene to me and I guess maybe it is to others too!